As the Pew Internet Project documented in its “Home Broadband 2009” report, African Americans trail the national average in broadband access at home, and have experienced below-average growth in home broadband adoption the past two years. Some 46% of African Americans report having broadband at home in April 2009, up slightly from 43% in 2008 and 40% in 2007. The lower level of home broadband access among African Americans, in conjunction with lower levels of ownership of “heavy” access devices – desktop and laptop computers – helps explain less frequent online access when the questions are framed in terms of traditional access. The picture changes when including access on a handheld and with the broader measure of wireless use that includes laptops and other devices. For each measure, use among African Americans matches or exceeds that of white Americans. Two measures of engagement with the wireless online – accessing the internet on a handheld on the typical day or ever – shows that Africans Americans are 70% more likely to do this than white Americans. When tethered and wireless access are considered together, the gaps in online engagement between whites and blacks largely dissipates. 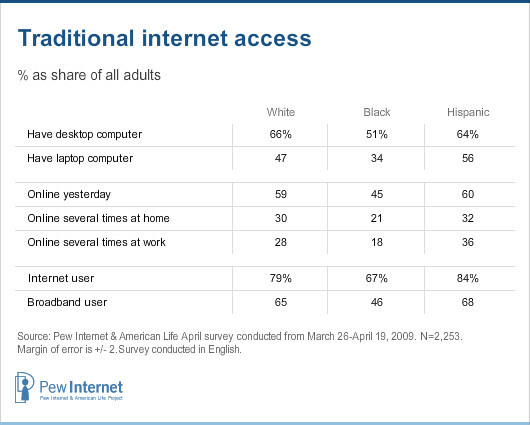 Nearly as many African Americans have cell phone or online access as whites, with a gap of only 4 percentage points. African Americans tend to be more oriented to use of the handheld device, while whites are more likely to engage in a wider range of online activities.5 Though African Americans have a slightly higher average for the total number of digital activities, the difference between whites and blacks is not statistically significant. Additionally, the likelihood of going online “yesterday” changes when mobile access enters the picture. The survey question on whether someone used the internet yesterday is framed largely in terms of computer access, as it follows shortly after a respondent is asked whether he uses a computer. That question yields a 14-point gap between whites and blacks, as 45% of blacks say they went online on the prior day and 59% of whites say this. When mobile internet access is included, the gap narrows. 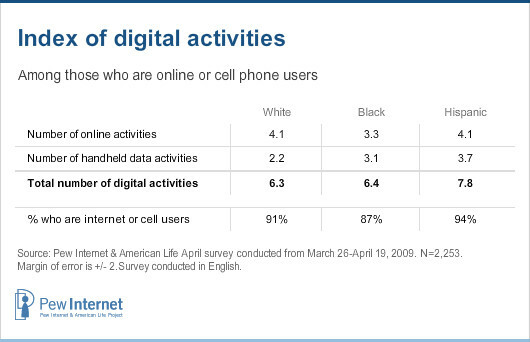 Some 54% of African Americans have gone online “yesterday” by mobile or other means, while 61% of whites have done this. These usage patterns suggest further that wireless access complements broadband access in different ways for whites and African Americans. Among whites who have ever gone online with a handheld device, some 88% have broadband at home. 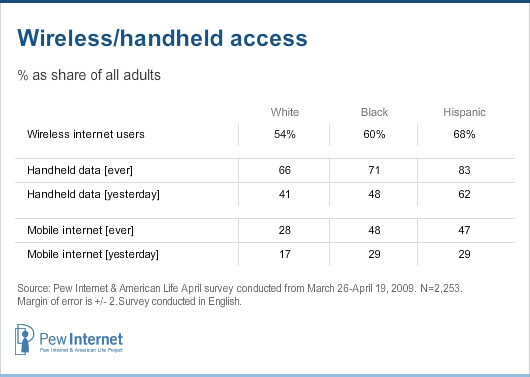 For African Americans who have accessed the net on a handheld, 64% have broadband at home. From the vantage point of non-broadband users, reliance on wireless access among African Americans is quite pronounced relative to whites. Among white Americans who do not have broadband at home (that is, they have either dial-up or are not internet users), 6% have accessed the internet on a handheld device. For African Americans without broadband, nearly one-quarter (25%) have used the internet on their cell or Smartphone. Overall, it seems clear that white Americans and African Americans have somewhat different outlooks on the meaning of online access. For white Americans, online access is likely to occur on a broadband connection at home with a laptop or desktop computer. For African Americans, using the onramp to internet is, in contrast to whites, more likely to be a handheld device on mobile wireless network – and not nearly as likely to be on a wireline home broadband connection. To an extent notably greater than that for whites, wireless access for African Americans serves as a substitute for a missing onramp to the internet – the home broadband connection. The tables above show clear differences in use of the internet – wireless and wireline – among Hispanic respondents to the survey. English-speaking Hispanics are ardent users of wireless access, whether that is on a handheld device or a laptop computer. Overall, English-speaking Hispanics are the heaviest users of wireless onramps to the internet. It is important to note, however, that this survey did not provide a Spanish language option for respondents. This means that respondents whose primary language is Spanish were not participants in the survey. The lack of a Spanish language option means the Hispanics in the April sample are collectively better off socio-economically than if the sample included respondents who had the option to take the survey in Spanish. The Pew Internet Project conducted a survey in December 2008 that included a Spanish language option, and that survey showed that 28% of Hispanics in that sample had household incomes below $20,000 annually. The April 2009, in contrast, showed that 18% of Hispanic respondents in the sample had household incomes below $20,000 annually. Similarly, 14% of Hispanics in the December 2008 survey were college graduates compared to 26% in the April 2009 survey. Finally, English-speaking Hispanics are generally younger than other Americans; the median age for English-speaking Hispanics is 35 in the April 2009 survey compared with a median age of 44 for the entire sample. As to broadband penetration, the December 2008 surveyed showed that 37% of Hispanics had broadband at home (compared with an average of 56% at that time) while the April 2009 survey – without the Spanish language option – showed that 68% of English-speaking Hispanics had broadband at home (against the 63% average). All of this is to say that the results above for Hispanics should be interpreted in the proper context. The English only nature of the April 2009 survey resulted in a sample of Hispanics that collectively has a higher socio-economic status than the December 2008 sample with a Spanish language option. This suggests that the sample of Hispanics in the April 2009 survey is more tech-oriented than if the sample had included Hispanics who availed themselves of the option to take the survey in Spanish.